Cuban human rights activists are facing a surge in harassment in a bid to silence them during the Pope's visit, Amnesty International said. The clampdown has seen an increase in arrests, activists' phones have been disconnected and some have had their houses surrounded to prevent them denouncing abuses during Pope Benedict's tour. Local human rights organizations, including the Cuban Commission on Human Rights and National Reconciliation, had their phone lines cut off since Monday. The mobile phones of prominent activists and government critics are suddenly unreachable. “The communications’ blockade and the detention of more than 150 political opponents is yet another example of how authorities in Cuba completely disregard human rights,” said Javier Zúñiga, Special Advisor at Amnesty International. “The Cuban authorities must urgently stop harassing activists and ensure everybody in Cuba is free to voice their opinions so activists can carry out their legitimate activities,” said Javier Zúñiga. 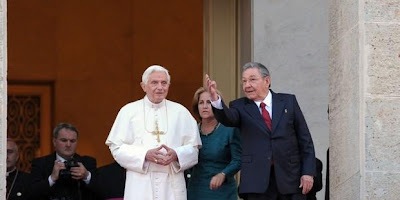 On Monday 26 March, dozens of government opponents were detained in Santiago de Cuba where the Pope gave a public mass at the start of his visit. Police and state security officers also surrounded the homes of many opponents and kept them under siege preventing them from attending the Pope’s mass or moving freely. Short-term detentions of government opponents, human rights activists and independent journalists are routine in Cuba. On the lead up to the Pope’s visit, hundreds of government opponents were detained for short-periods of time, threatened or prevented from traveling freely. Nine years later: Another Cuban Black Spring?